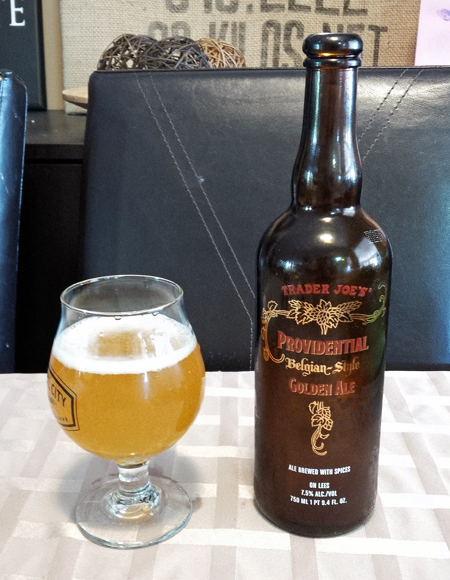 Trader Joes (Unibroue) Providential Belgian Golden Ale: Aged close to a year, this a Belgian Strong Ale brewed in Quebec exclusively for Trader Joe’s and was enjoyed in a snifter glass after making some beermosas. Aroma and Appearance: It pours a hazy golden orange with a lot of fizz that goes away quickly, loads of bubbles and crazy foam on the first pour. The aroma is clove, coriander, acidic and a touch of ginger spice. Flavour: It hits you with a hot ginger and spicy flavour right away with some coriander and chili powder notes, followed by a light effervescent mouth feel and a little hidden malt balanced with more pepper and a gingery coriander aftertaste. Overall Impression: This is one of my favourite beers, after it aged a bit the spices combine perfectly into a super delicious ale. Rating: I give it an awesome rating of 9/10, this one improves with age and is available for like $5 a bottle across the border, even after paying duty it runs about $8 a bottle if you can’t stay 48 hours if and you need to bring it back to Canada. Food Pairing: Spicy sausage or turn into a beermosa. I bought a case of these close to a year ago and have tried it about once a month, it just keeps getting better and better. Warning, it’s corked so not one to open after a few!